He was completing his PhD at the time and snapped a quick cell phone photo of his findings through the microscope to show his mentor and supervisor, Dr. Brian Wilson. And then it struck him. Cell phone cameras have the ability to pick up these fluorescent signals in real-time. So, Dr. DaCosta, now a Molecular Imaging Scientist at Princess Margaret Cancer Centre and Techna Institute, University Health Network, thought: Is it possible to create a handheld, cell phone-type device that instantly visualizes and targets bacteria in wounds in real-time? Yes – and he invented just that. Dr. DaCosta founded venture-backed MolecuLight Inc. to commercialize the technology on June 1, 2012. On Oct. 20, 2015, Health Canada approved the company’s first product, the MolecuLight i:X, a first-of-its kind handheld fluorescence imaging device based on Dr. DaCosta’s invention. The device enables clinicians to see and target bacteria in skin and chronic wounds in real-time. “Chronic wounds and the impact of infection have been called the silent epidemic – one which diminishes patient quality of life, strains health care systems, and contributes to antibiotic resistance. Innovative technologies are needed to address these issues,” says Dr. DaCosta. Chronic wounds resulting from hospital-acquired infections, an epidemic of diabetes and the increasingly complex health issues of an aging population, are a growing burden on patients, health-care providers and health-care systems. 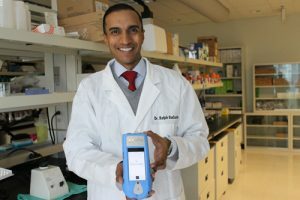 The first clinical trial to validate Dr. DaCosta’s device was in 2009 on patients with diabetic foot ulcers at the Judy Dan Research & Treatment Centre in Toronto. Given bacteria contain molecules that produce unique fluorescent signals, the device was designed to illuminate a patient’s wounds with a specific wavelength of violet-blue light to excite these various molecules. Then, a sensitive camera with a customized imaging filter captures the fluorescent signals from the bacteria and tissue in real-time and without the use of contrast agents – which are commonly used to enhance visibility in medical imaging. 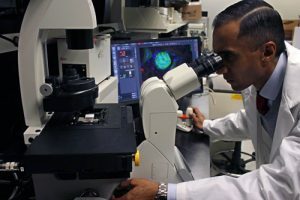 The trial confirmed the benefits of fluorescence imaging in wound healing; physicians were able to see what they couldn’t before. While Canadian standard-of-care wound assessment uses subjective signs and symptoms, in addition to the Levine method whereby clinicians sample the wound using a swab to confirm the infection – MolecuLight i:X enables clinicians to rapidly detect clinically-significant bacteria in and around the wound for target sampling and better treatment decision-making. “The need for better methods of assessment and diagnosis in patients with wounds is urgent if we are to deal effectively with the rapidly increasing number of patients who have these problems,” says Dr. Keith Harding, University Dean of Clinical Innovation at Cardiff University, Wales, UK, and Editor-in-Chief of the International Wound Journal. “This device will assist in moving the art of wound healing into a respected and scientific discipline recognized globally,” he adds. MolecuLight i:X can take photos and videos similar to a point-and-shoot digital camera. Clinicians can easily upload and monitor important bacterial information on a patient’s file over time, wherever they are treated, be it in hospitals, long-term settings, or in home care. “Improving the management of patients with infected wound care is just the first of many potential medical uses for this technology,” says Dr. Brian Wilson, Senior Scientist at Princess Margaret Cancer Centre, Co-lead, Photonics, Techna Institute, and co-inventor of the technology. Later this month, MolecuLight i:X will be used in a new clinical trial to detect bacterial infections in burn patients – and determine whether fluorescence-imaging can be used to target bacterial growth in wounds after skin grafting. The handheld fluorescence device is also involved in a first-of-its-kind clinical trial at the Princess Margaret to determine whether fluorescence imaging can be used in real-time during breast- conserving surgery. The technology helps surgeons ‘see’ tumour cells and map tumour margins more effectively. Surgical oncologists Wey Leong and Alexandra Easson, and pathologist Susan Done at the Princess Margaret are working in partnership with Dr. DaCosta’s team on the trial. “As a scientist, you spend so much of your time studying something – finding out how the pieces fit together,” says Dr. DaCosta.